Never tried improv before? This is the perfect introduction! We’ll work on teamwork, listening and presentation skills through fun improv games. It’s a great way to improve your public speaking, have fun and meet new people. FRIEND DISCOUNT: Sign up with a friend and save $20 on classes! EARLY BIRD DISCOUNT: Register before 11:59 pm on Sunday, April 21 for 10% discount. Adriana started her improv journey in Copenhagen, Denmark at Improv Comedy Copenhagen (ICC), has studied in Toronto at Second City, and is a graduate of the Improv Embassy. She loves practicing and performing with her team, CLAM, who have entertained audiences at the 2019 Ottawa Improv Festival, the Fembassy, and various indie shows in Ottawa! Her favourite improv game is the Beastie Boys Rap and when she’s not doing improv, you’ll find her tending to her many houseplants! 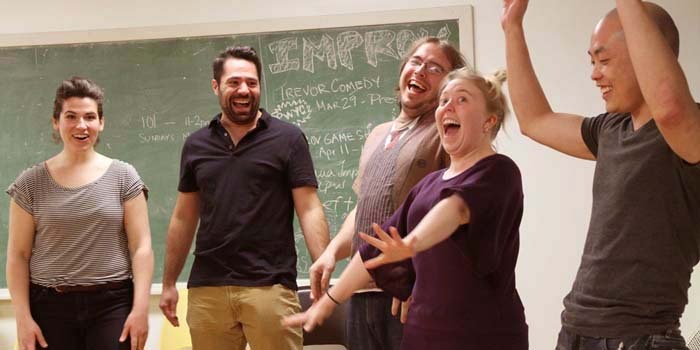 Laura knows that improv is first and foremost about having fun. She started performing improv in 2012 and never looked back, becoming 3 term president of McGill improv, competing all over, and having a dang good time. In Ottawa she performs with CLAM and Chess Club 7 and coaches student teams, on top of teaching real life non-improv school full time.